Speed: Determines the speed at which you move while mounted. Valuable for crossing large distances in Cyrodiil. Stamina: The health of your mount. Decreases when hit or while sprinting. You will be forced to dismount if hit when this stat is at zero, so upgrading stamina will allow you to take more damage before this happens. Capacity: Similar to bag space upgrades, this stat allows you to increase your passive carrying capacity. Each upgrade increases your backpack capacity by 1 point. Each upgrade costs 00000250250  . A single mount is needed before you can increase your Riding Skill. 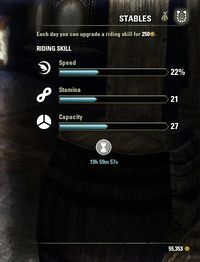 Riding Lessons can also be purchased from the Crown Store in order to speed up the training process. After 20 points in a single stat, a cosmetic upgrade will be applied to your mounts (a bridle for Speed, armor for Stamina, and saddlebags for Capacity). These can be turned off in your gameplay settings. Riding Skill is not technically considered to be a skill. However, the War Mount passive ability can be unlocked by investing 120 Champion points into the Tower perk tree. Before Update 6, mount stats were tied to individual mounts rather than a character's Riding Skill. Each mount would need to be "fed" daily, increasing its level up to a maximum of 50 and therefore limiting its final stats. Only five individual mounts could be owned at any one time, and only after buying all available Stable Spaces, with prices increasing from 0000001010  all the way to 0001000010,000  . Horses could also be sold back to clear up space. By doing so, it was possible to set a character as having no active mount, which is no longer possible with the Collections system. However, switching mounts at the time required speaking to a stablemaster, which can now be done directly from the Collections screen. This page was last modified on 14 April 2019, at 14:57.